Below is a sample designed to assist you with understanding your billing statement. The figures and dates given on this sample are for illustration purposes only and do not reflect your personal charges/credits or actual payment due dates. Please review your billing statement very carefully. Your statement reflects your registration schedule and charges/credits as of the statement date. STATEMENT DATE – The date the statement was generated. SEMESTER BALANCE – The total amount of charges minus credits/anticipated credits for the current semester. PREVIOUS/FUTURE BALANCE – The total amount of charges/credits that remain on the account from a previous or future semester. This balance may be due/available now or in the future. You can view details of this balance in your account history or account summary by term. AMOUNT DUE – The amount that must be paid in full by the due date. DUE DATE – The date the bill must be paid. Late payments may result in late fees/interest and restrictions on services such as registration, transcripts, dining plans, etc. Please allow time for financial aid, 529 plan payments, and any other outside payments to be processed and received before this date. 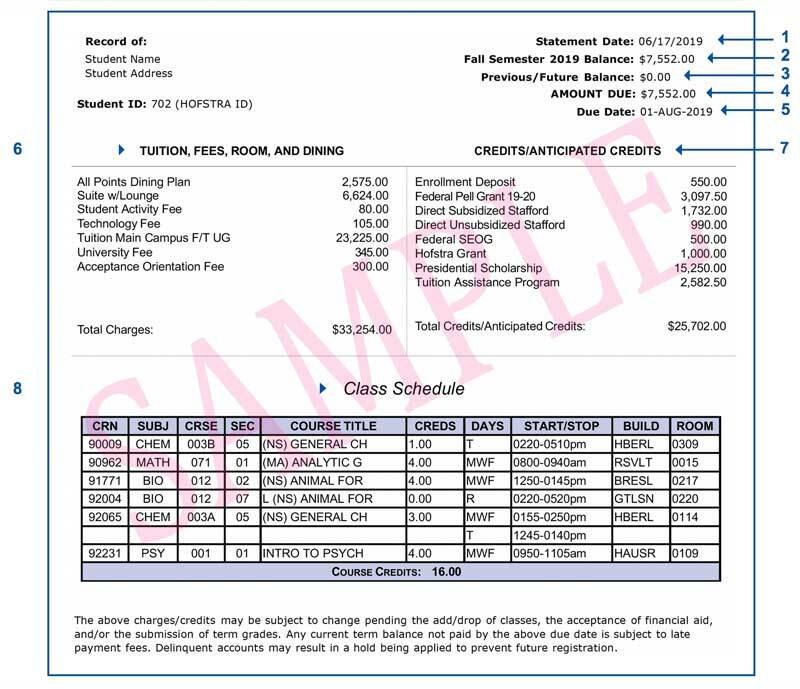 TUITION, FEES, ROOM, AND DINING – A summary of all charges, including tuition, University fees, room, dining plan, special course fees, and any fines for the semester. Changes in your registration can affect these charges. You are responsible for charges that result from changes to your class schedule. New students entering in the fall – If you have not participated in orientation, your bill reflects estimated charges based on your anticipated course load. An updated billing statement will be available on the portal after you register, but the due date will not change. CREDITS/ANTICIPATED CREDITS – A summary of your payments, including anticipated financial aid and future payment plan payments for the semester. This may include anticipated aid based on your current credit load. Changes in the number of credits for which you are registered may affect your financial aid. CLASS SCHEDULE – Your class schedule as of the printing of this statement. If you made recent changes to your registration, they may not be reflected here. You can view your most up-to-date schedule on the Hofstra portal (my.hofstra.edu). If a class does not appear on your online schedule of classes, you are not registered for that class and will not receive credit. STUDY – This course is part of a study abroad opportunity. ONLINE – All material, discussions, etc., for this course will be delivered via the internet. 205 Memorial Hall, 126 Hofstra University, Hempstead, NY 11549-1260. Please include your Hofstra student ID on your payment for proper processing. Cash and money orders are accepted only in person at the Student Financial Services Suite, Room 206 Memorial Hall, South Campus. Payment Plan Options – Hofstra University offers interest-free payment plans to students and those helping them pay for their education. Students may divide their total outstanding balance, after financial aid, into easy-to-manage monthly installments. Further information regarding payment plan options is available at hofstra.edu/paymentoptions. Please note that payment plans are not available for the January intersession and summer sessions.